The WM-172 is a female TPE love doll by WM Doll. The WM-172 features a life-sized body height of about 172 cm (67.71") and weights ca. 42 kg (94.6 lb; manufacturer specs). Body measurements: 89 cm / 35.03" (breasts) - 57 cm / 22.44" (waist) - 94 cm / 37" (hips) - 98 cm / 38.58" (leg Length) - 70 cm / 27.55" (arm length) - 35 cm / 14" (shoulder width). Many attributes of the WM-172 can be customized individually; for example, the skin tone, the eye color, and the hair color is configurable. The WM-168/E is currently one of the tallest TPE love dolls by WM Doll. The WM-168/E has a body height of about 168 cm and weights ca. 40 kg (according to the manufacturer's specification). Body measurements: 93 cm (breasts) x 60 cm (waist) x 93 cm (hips). The WM-168/G is currently the heaviest TPE love doll by WM Doll. The WM-168/G has a body height of about 168 cm and weights ca. 54 kg (manufacturer specs). Body measurements: 110 cm (breasts) x 78 cm (waist) x 120 cm (hips) / 84 cm (under bust) / 24 cm (foot length) / 110 cm (thigh girth) / 32 cm (upper arm girth) / 104 cm (leg length) / 42 cm (shoulder width). The WM-167 is a life-sized TPE love doll by WM Doll. The WM-167 has a body height of approximately 167 cm and weights ca. 41 kg with head (manufacturer specs). Body measurements: 98 cm (breasts) x 61.5 cm (waist) x 95 cm (hips) / 63 cm (under bust) / 90 cm (legs). The WM-166/E is one the tallest TPE love dolls by WM Doll. The WM-166/E has a body height of about 166 cm (65.35") and weights ca. 33 kg (72.75 lb; manufactur specs). 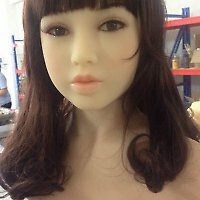 The WM-165 is a life-sized TPE love doll by WM Doll. The doll has a body height of 165 cm and weights 29,5 kg (according to the manufacturer's specifications). 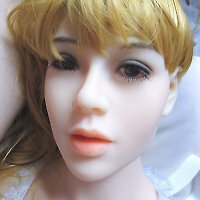 This female love doll is one of the tallest models by Chinese manufacturer WM Doll. Body measurements: 78 cm (breasts) x 53 cm (waist) x 77 cm (hips). Lots of properties may be customized; for example, you can select different skin tones, eye colors, and hair colors - just as you are used from WM Dolls. The WM-163/C is one of the tallest TPE love dolls by WM Doll. The female doll a body height of about 163 cm, but still doesn't weight more than ca. 32 kg (according to the manufacturer's specifications). Body measurements: 82 cm (breasts) x 62 cm (waist) x 82 cm (hips). The WM-162/A is a female TPE love dolls by WM Doll. The WM-162/A sports a body height of about 162 cm (5ft3") and weights ca. 42 kg (77.16 lb; manufacturer specs). Body measurements: 88 cm / 34.6" (breasts) - 75 cm / 26.37" (under bust) - 64 cm / 26" (waist) - 90 cm / 35.8" (hips) - 20 cm / 8.66" (foot Length) - 54 cm / 20.07" (thigh Girth) - 32 cm / 11.81" (calf girth) - 20 cm / 7.87" (ankle girth) - 13 cm / 5.11" (wrist girth) - 21 cm / 8.26" (upper arm girth) - 84 cm / 33.07" (leg length) - 66 cm / 25.98" (arm length) - 36 cm / 14.17" (shoulder width). Many attributes of the WM-162/A can be customized individually; for example, the skin tone, the eye color, and the hair color is configurable. The WM-161 is a life-sized TPE love doll by WM Doll. This doll has a body height of about 161 cm (63.38”) and weights ca. 36 kg (79.34 lbs, manufacturer specs). Lots of attributes may be customized; for example, you can select different skin tones, eye colors, and hair colors - just as you are used from WM Doll. 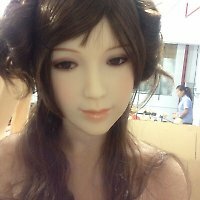 The WM-158/D, also known as Gwen, is a life-sized TPE love doll by WM Doll. The WM-158/D has a body height of about 158 cm and weights ca. 30 kg (manufacturer specs). Body measurements: 85,5 cm (breasts) x 60,5 cm (waist) x 86 cm (hips). Within WM Doll's product line, this well-proportioned beauty is located in-between the five cm taller WM-163 and the fife cm smaller WM-153. Though, with a breast size of about 86 cm, the WM-158's breasts are visibly larger: With breast sizes of 82 cm (WM-163) resp. 78 cm (WM-153), the next taller as well as the next smaller model is significantly less voluptuous. Head No. 9 aka Melody is a female head by WM Doll. The head is made of TPE. Head No. 31 aka Bo (Jinshan no. 31) is a female head by WM Doll. The head is made of TPE. Head No. 28 aka Mayumi (Jinshan no. 28) is a female head by WM Doll. The head is made of TPE. Head No. 22 aka Kim (Jinshan no. 22) is a female head by WM Doll. The head is made of TPE. Head No. 10 aka Lauren is a female head by WM Doll. The head is made of TPE. Head No. 12 aka Sophia (Jinshan no. 12) is a female head by WM Doll. The head is made of TPE. Head No. 18 aka Mandy (Jinshan no. 18) is a female head by WM Doll. The head is made of TPE. Head No. 20 aka Tina (Jinshan no. 20) is a female head by WM Doll. The head is made of TPE. The Torso by WM Doll is something special: It comes with a head connector allowing to exchange the head. 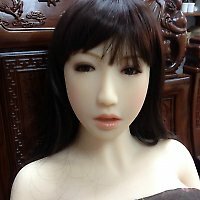 With this torso, you can enter the world of life-like TPE dolls for a small price and later upgrade for a full doll body - and re-use the head. This torso has a height of 63 cm (without head) resp. 78 cm (with head) and weights 14 kg (without head) resp. 15,5 kg (with head). Body measures: 80 cm / 70E Cup (breast) × 55 cm (waist) × 88 cm (hips). Shoulder width: 35 cm. The Legs 100 cm by WM Doll are a good value alternative to complete body dolls or torsos. By focusing on the essentials, this pair of legs is quite handy and rather easy to store.